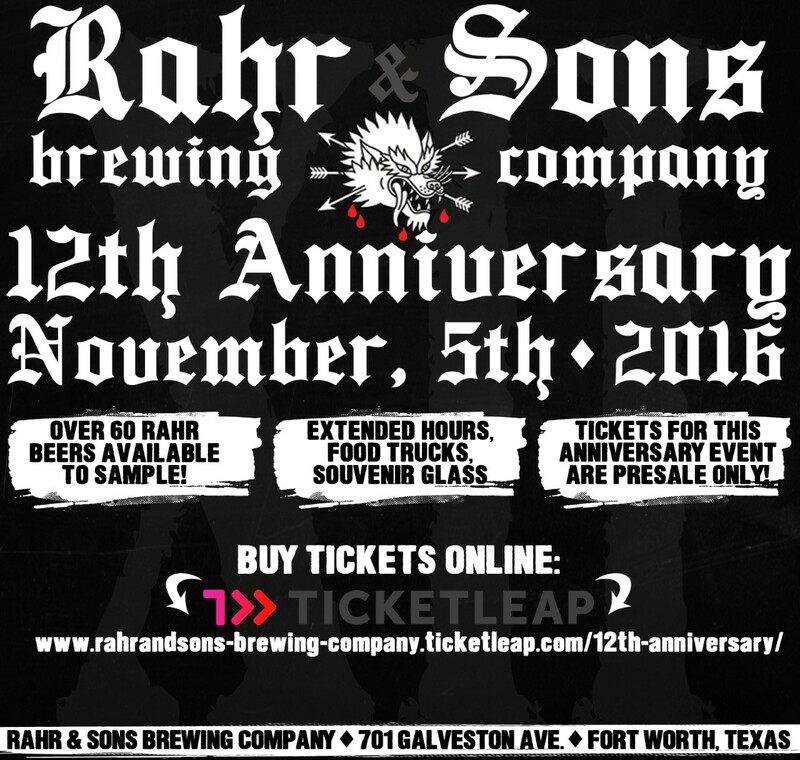 Rahr & Sons Brewing Co. of Ft. Worth has released details on its upcoming 12th anniversary celebration, as well as the beer it has crafted to commemorate the occasion. Regarding the beer, Zwölfjahre is an American-style wheat wine that was fermented with a blend of American and German yeast strains. The beer, whose name means 12 years in German, was then aged for 12 weeks in cabernet wine barrels with cherries. It's described by the brewery as having a flavor profile featuring "a significant amount of wheat with hints of citrus hops." 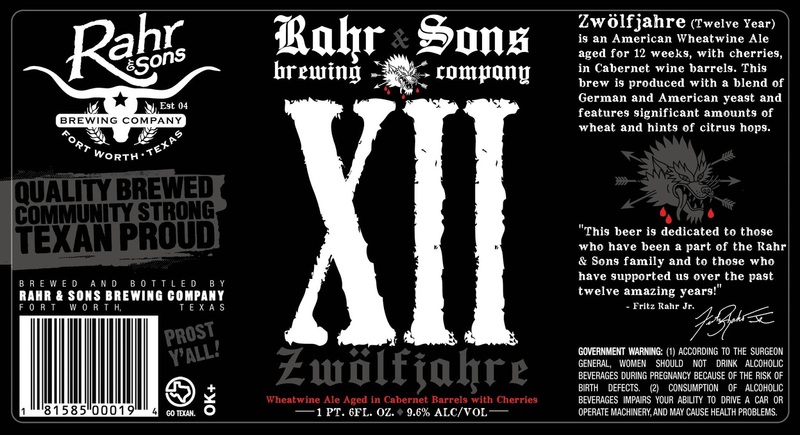 Label graphic that will appear on 22-ounce bottles of Zwölfjahre (Rahr & Sons Brewing Co.
Zwölfjahre will debut during a special 12th anniversary event happening at the brewery on Saturday, November 5 from 11 a.m. - 4 p.m. A selection of over 60 beers will be on tap over the course of the day, with the lineup including other rarities like Bourbon Barrel Aged Regulator and a 2014 vintage of Midnight Cab. 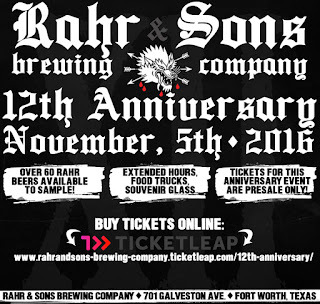 Tickets for the anniversary party are on sale now at rahrandsons-brewing-company.ticketleap.com, with prices set at $20 for regular admission and $55 for VIP. Those choosing the VIP option will gain early entry to the festivities, a food voucher, t-shirt and access to additional specialty beers. 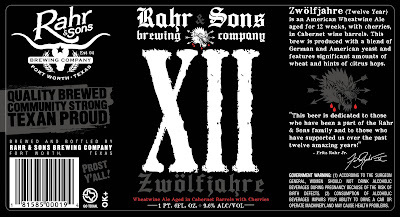 After the event, look for Zwölfjahre to be available on tap and in 22-ounce bottles throughout the Metroplex. Labels: anniversary beers, barrel aged beers, Fort Worth, press release, Rahr & Sons Brewing Co.